Aviva Premiership Rugby club London Irish have confirmed that back row Tom Guest has agreed to leave Harlequins and join the Exiles at the end of the season. Guest went through the Harlequins Academy and made his debut in 2005. He recently played his 200th game for the London side against Cardiff Blues when he also captained the team. He has scored 26 tries over the course of his eight year career at the club. The twenty-nine year old has also represented England Saxons in the Churchill Cup games in 2008 and 2009 as well as being named in the squad to face Italy A in February 2008. He also competed in the 2007 Dubai Sevens for England. Harlequins Director of Rugby Conor O’Shea commented,”Tom has been one of Harlequins’ great servants having recently celebrated his 200th game. 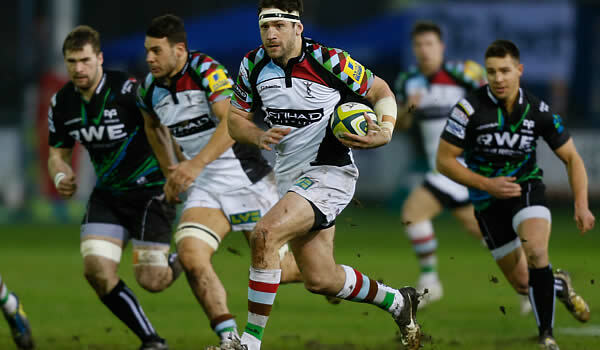 Tom Guest added,”I have been at Quins for 12 years and had a great time throughout. I’d like to thank all the coaches and everybody at the club, with a special mention to Collin Osborne who has been there for me since I was 18 and has done so much for me. “I have spent over a decade at Harlequins and have enjoyed every minute of it. Guest was part of the Harlequins squad that won the 2012 Aviva Premiership title at Twickenham against Leicester Tigers and the 2011 Amlin Cup against Stade Francais in Cardiff. Born in Taplow, Buckinghamshire, Tom has previously been around the England sevens set up and has also had success with the England Saxons, winning the Churchill Cup in 2008. London Irish Director of Rugby, Brian Smith, admits Tom is a player he has admired for some time and is delighted he is joining for the next two seasons.